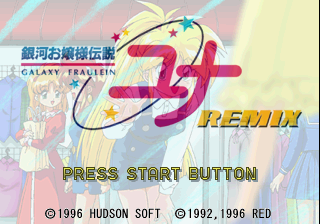 Ginga Ojousama Densetsu Yuna Remix (銀河お嬢様伝説ユナREMIX), also known as Galaxy Fraulein Yuna Remix, is an adventure game developed by Red and published by Hudson Soft for the Sega Saturn. It is a remake of a 1992 PC Engine CD game, Galaxy Fraulein Yuna. It comes with a binder and calendar. Three more games in the series were released for the Saturn: Ginga Ojousama Densetsu Yuna 3: Lightning Angel, Ginga Ojousama Densetsu Yuna: Mika Akitaka Illust Works and Ginga Ojousama Densetsu Yuna: Mika Akitaka Illust Works 2. Main article: Ginga Ojousama Densetsu Yuna Remix/Magazine articles. NEC Retro has more information related to Ginga Ojousama Densetsu Yuna.